Channel 2 has for so many years been the CBS “owned and operated” station in Los Angeles that one might suppose it was the Columbia Broadcasting System that launched it. Not so. In fact, it was once an affiliate of another network, Du Mont. Back then, its call letters were KTSL. When KTSL aligned itself with Du Mont, it became an affiliate of that network, but was was not “hooked up” with it, in the physical sense. Coast-to-coast hook-ups (by cable or microwave relays) were yet to come. With TV shows then originating on the East Coast, no Du Mont shows were seen here live. Nonetheless, the new arrangement provided uplifted potential for both parties. Du Mont needed an L.A. outlet and KTSL needed Du Mont. 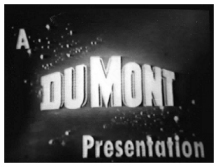 Or was Du Mont — generally misspelled DuMont — actually the Number Three network when Channel 2 joined it in 1948? Clearly, NBC was in front; CBS was second. These were long established radio networks. Each network had its radio affiliates, many of which launched TV stations which became the network’s television affilates. Vying for status as the third network were Du Mont and ABC. Du Mont’s network was born in 1946 when two of its East Coast television stations, WABD in New York and WTTG in Washington, were linked. In the two years that followed, Du Mont amassed more outlets than ABC, although several were on the UHF band which most sets were not equipped to receive. Nonetheless, in its heyday, Du Mont owned three stations and had 175 others as affiliates. The American Broadcasting Company was, like Du Mont, a relative newcomer to broadcasting. In 1941, the FCC ordered the National Broadcasting Company to divest itself of one of its two radio networks, NBC Red or NBC Blue. That order was upheld in 1943 by the U.S. Supreme Court. A candymaker, Edward Noble, bought the Blue Network, and it became ABC. As of the late 1940s, it was anyone’s guess whether either of these fledgling networks — or, indeed, whether CBS or NBC — would triumph in the seemingly up-and-coming (but perhaps never-to-succeed) medium of television. Shows on the Du Mont network included “Arthur Murray Party,” “You Asked for It,” “Adventures of Ellery Queen,” “Twenty Questions,” “Charade Quiz,” “Spin the Picture,” and “Captian Video.” Unfortunately, none of those shows made it to KTSL. “Cavalcade of Stars” (a variety show which made Jackie Gleason a star and introduced the “Honeymooners” skits); “Cavalcade of Bands” (each week featuring a different top-name band); “Morey Amsterdam Show” (a comedy/variety series); “Plainclothesman” (an innovative detective show seen through the eyes of the principal character); “Famous Jury Trials” (courtroom dramas); “Hands of Mystery” (murder/suspense plays); “Rocky King, Inside Detective” (a crime show); “Once Upon a Tune” (a one-hour musical, generally a parody); and “Manhattan Spotlight” (15-minute interviews from the New York station).